The Nissan LEAF is a peppy, emission free, and popular electric vehicle. The Nissan LEAF offers drivers and passengers alike a wide-variety of technology-rich features that can make their travels much more pleasant. In addition to such features, this electric vehicle also offers a number of tools that are designed to maximize operator alertness. Among these tools are specialized High Beam Assist systems as well as Intelligent Driver Alertness technologies. Night driving can be dangerous enough without high beams from oncoming vehicles interfering with driver vision. The Nissan LEAF includes a proprietary system called the High Beam Assist service. This technology can sense when oncoming vehicles are getting within headlight range, after which it can automatically switch high beams to low beams in order to promote greater driver awareness. Once vehicles pass, this system once again re-engages high beams. Another technology that helps to keep drivers and passengers safer is the Nissan Intelligent Driver Alert system. Sustained driving for many hours can cause driver fatigue and even drowsiness. 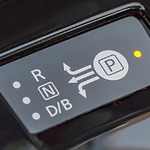 The Intelligent Driver Alert system can actually monitor driver attention levels and give drivers special auditory and visual alerts in order to arouse them.